This is Fiocchi 40 S&W 180gr. FMJ Truncated Ammo. 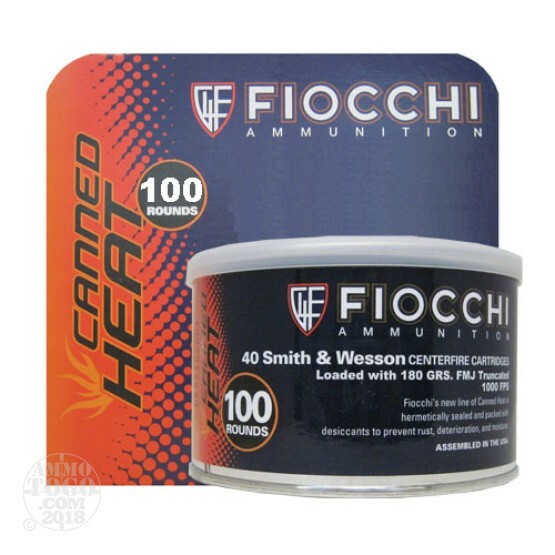 Fiocchi's new line of Canned Heat ammo is hermetically sealed and packed with dessicants to prevent rust, deterioration and moisture. This ammo is brass cased, boxer primed, non-corrosive and 100% new factory fresh. Muzzle Velocity of 1000fps. This ammo comes packed in 100rd. sealed cans.